Twenty five years ago we sailed with P&O to the pyramids. It was our first cruise and we loved it! A decade ago we cruised with Crystal through the Panama Canal to Acapulco and it turned out to be one of the most memorable of the many cruises we have done. Memorable because we laughed a great deal, thanks to Mike Goddard an English comedian who went down a treat with the mostly American passengers, a luxury cabin, which offered butler service, and a delicious dinner of roast pheasant that appeared out of the blue when we decided to put to the test the dining room’s claim that if we didn’t fancy anything on the menu they would come up with almost anything of our own choice! So when we were asked by Crystal if we would like to cruise again, this time on Crystal Serenity out of Southampton heading for Ireland, Portugal, Spain, Monte Carlo and Italy, to be spoiled rotten in a penthouse suite, complete with butler service once more, and the chance to meet up with the hilarious Mike Goddard we did of course say yes. We recommend staying in a hotel before joining a ship. It seems to set you up for the easy-come easy-go lifestyle that is ahead of you for the next couple of weeks and since we were leaving from Southampton we unashamedly plumped for Chewton Glen, a lovely, award winning country house at New Milton on the south coast. We flew from Newcastle in the north of England with a little airline called Eastern Airways and the plane, a twin prop job with barely a dozen passengers on board, was a delight. It was how flying should be – civilised, enjoyable and great fun! With a hop, skip and a jump we were airborne. It was a beautiful clear day and flying at 10,000 feet we could see everything below us. A friendly air stewardess served us bubbly and nibbles and by the time we finished our second glass (or was it our third?) we were ready to descend over Southampton. Our chauffer was waiting at the airport and escorted us to our car which whisked us off to Chewton, a forty minute drive through the famous and beautiful New Forest. We have written about Chewton before for Sally’s Place but things have changed. Martin and Briggite Skan, the original owners, have retired and sold up. The new boss proudly leaves it in the hands of Managing Director Andrew Stembridge and we’re very pleased to say that the hotel has gone from strength to strength. The atmosphere is wonderfully English and extremely relaxed. We had a most beautiful room with its own balcony to sit on, surrounded by petunias and geraniums. A pair of cheeky magpies, usually very wary birds, joined us. They had obviously learned that this was a place to hang around for the odd rich picking. Dinner was served in the conservatory looking out over the gardens. The smell of wisteria, clinging to the pergolas and outside walls, drifted in over the tables as we ordered. A glass of champagne with perfectly cooked scallops and lobster, fillet of beef and a summer pudding. What more could we want? Chewton Glen’s spa is one of the best in Europe and dipping in and out of the therapy pools after a good swim got us in just the right mood for a relaxing and delicious breakfast of yogurt fruit and honey overlooking the swimming pool. With plenty of time to make it to the ship (it sailed at 9pm for Dublin) there was no hurry so we had lunch in the garden next to the croquet lawn and then our chauffer turned up again to take us to the ship. Approaching a cruise ship for the first time is very exciting. It has something to do with going to sea, which is such an adventure, and from the moment you step on board you immediately feel an attachment to your chosen vessel. The car dropped us off with our luggage and in no time at all we cleared security and registration and found ourselves being led away to our cabin, or to be more precise our suite on Deck 11. 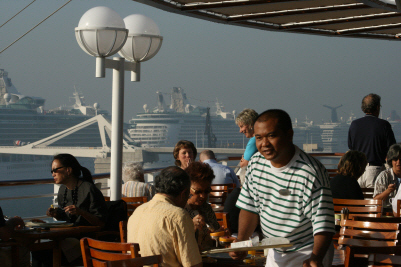 Deck 11 is affectionately known as the butler’s deck. This time we waltzed into a beautiful suite with a private veranda. It had a dining table, spacious living area with flat screen TV, DVD and CD player, a separate bedroom with a queen sized bed, Jacuzzi bath tub with separate shower, toilet and bidet. Oh, and there was a walk-in wardrobe too. What luxury! Getting your bearings is always the difficult bit of cruising. It’s not unusual to find passengers still wandering around several days into the cruise trying to find their cabin! The trick is to know whether you are going forward or aft and Crystal does everything it can to keep you heading in the right direction. Even the lifts have notices telling you where you are. With your key comes a handy pocket guide to the ship and that’s what you should carry at all times. It will save a good deal of embarrassment! Leaving Southampton, our first port of call was Dublin, the capital of Ireland. We could have taken part in one of the many organised shore excursions on offer but we opted instead to make our own way into the city by shuttle bus to explore Georgian Dublin and wander through the broad squares and terraces around Merrion Square, where during the middle part of the eighteenth century there was a building boom. Looking at the immaculate front doors, painted red, blue, black and green, the sweeping fanlights above them and the brass knockers and letter plates shining in the sunlight, it was difficult to believe that these original features were 250 years old. The National Gallery is also close by, brimming with Irish paintings, while the National Museum has an astonishing collection of Irish Bronze Age gold and early Christian artefacts. The Natural History museum is also worth popping into. Walking the streets sharpened our appetites and so we headed for the handily placed Merrion Hotel, part of The Leading Hotels of the World group, which was perfect for a long lunch. The Merrion is a beautiful Georgian building. Their cast iron and marble fireplaces still burn peat, which leaves a wonderful, sweet smell floating around the rooms. Downstairs in the vaulted basement they have created a charming restaurant. Nice and cool on a hot day we tucked into our lunch of chicken and new potatoes and a crisp salad which could have come straight out of their gardens. One of the great pleasures of cruising is meeting people from another country and in our case from America. The sea seems to magically bring people together and there are many tales of lasting friendships, and even romances, as a result of a chance meeting on a cruise ship. One of the best ways to properly talk and get to know people is over dinner. Apart from the main dining room there are two alternative restaurants to eat in – one Italian and the other Asian. There is also a sushi bar, bistro and Lido Café where excellent ice-cream was always available. In addition to all that of course there is twenty four hour room service. Overall the food is outstanding for such a large ship. The menus are varied and feature a good selection of meat, fish and vegetarian dishes. There are two sittings for dinner in the Crystal dining room and we opted for the last sitting and a table of at least six. Tables for two are of course popular but we always go for the biggest table we can – six or eight being ideal. The reason is simple. You have a good chance of meeting interesting fellow passengers which makes the cruise that much more interesting. 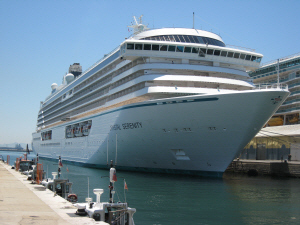 The two Crystal ships Symphony and Serenity carry about a thousand passengers and both are rated five star by the much respected Berlitz Guide to Cruising written by Douglas Ward. Douglas spends at least nine months of every year cruising on the world’s cruise ships. 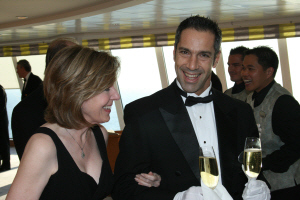 Our table companions, Ron and Kathy Sabo from New York, had fallen for cruising in a big way. It was their first time on Crystal and they fell head over heels in love with the ship. 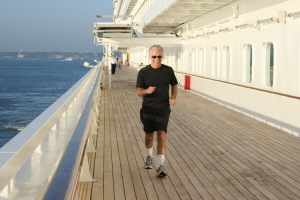 Ron was particularly fond of power-walking and his favourite workout was on the wrap-around promenade deck where you could find him every morning and evening! To say that he was a fitness fanatic might be overstating matters but he certainly put us to shame! He loved a particular kind of salad with ranch dressing, ate fish and hardly any meat, stayed off alcohol and looked a million dollars! Kathy on the other hand was much more sensible. She liked a glass of champagne every night and a little wine with her dinner and didn’t worry about piling on a few pounds. A measure of their affection for the ship was that before the end of the cruise they had booked up for the Baltic the following year. And then there was Jennifer from Portland, Oregon who we bumped into on the top deck taking pictures of the famous suspension bridge over the Tagus river as we left Lisbon. She had just bought the same Canon camera as us and valiantly came to our rescue when ours mysteriously stopped working while taking pictures of the Captain. Jennifer and her husband Jim had never cruised before and picked Crystal as the sort of ship that was most likely to appeal to them. They joined us on our table for dinner one night and we discovered that Jim was born in Southport, England and his mother was a GI bride. They later went to America where his father joined them a year and a half later after serving out his time in Britain. They too thought that Crystal had fulfilled all their expectations. They loved every minute of it and would almost certainly book again. We had been looking forward to Barcelona, where Mike Goddard the English comedian on the ship now lived. “You should go for lunch at Botafumiero. It’s one of the best restaurants in the city and the fish is fantastic.” If only we’d taken his advice. Ignoring the many organised shore excursions on offer, and thinking we’d escape the crowds, we took off in a taxi for the Sagrada Familia, Gaudi’s incredible church he might have designed for The Lord of the Rings. But we soon bumped into a huge gaggle of our fellow shipmates who had gone on guided tours. And, naturally, all the other ships in port had sent their passengers there as well. The crush was unbearable and the on-going building of the church had turned it into something of a building site with armies of builders doing what builders do best, making a lot of noise. So we hurried outside and gazed at the bits that didn’t have scaffolding clinging to them. Gaudi’s commitment and complete devotion to this project began in 1883 and when he was killed by a tram in 1926 only one of the twelve towers had been finished. Today eight are standing and with Gaudi’s body buried in the crypt you get the feeling that he is still overseeing this remarkable place. Walking down La Rambla we kept bumping into our fellow cruisers again. This time they were trawling through the shops, bars and restaurants. Unfortunately it left the whole street feeling distinctly overcrowded. It was our cue to return to the deserted ship for a beef burger and chips. Worldwide 16.5 million of us now go cruising and over the next three years twenty new ships are due to be launched, including a leviathan of 220,000 tons from Royal Caribbean. It means that many of the popular destinations are under siege at certain times of the year and where a port can handle huge numbers of ships, such as Barcelona, the result can be a sticky, horrible experience. But perhaps saturation point has, at last, been reached. Not according to Douglas Ward. Check out the cruise brochures and websites and there are huge discounts to be had, even on the top-rated ships. Competition has never been fiercer and when you tot it all up taking a cruise really does offer remarkable value for money. On deck seven you can cruise with Crystalat half price. This is where devoted cruiser Shoko Ito was berthed. She sails alone and when not in her Crystal cabin lives in a retirement home in Tokyo. Wisely she shunned the butler deck and had worked out that by conserving her money she could afford eight world cruises in the last ten years and now, at last, she was getting off after seven months! She had also discovered the joys of dancing and that, she told us, was what she wanted to do in her next life, so a quickstep in the arms of the Captain to celebrate her 103 cruises with Crystal was a breeze. We shopped and walked in the playground of the rich. After a flutter in the world famous Casino it was time for dinner in the Paris’ grill where the roof was peeled back to let the warm Riviera air drift around us. We devoured six courses brought to us by attentive waiters, including the Paris’ famous raspberry soufflé served there since 1898. And all the time our table looked out over the bay where Crystal Serenity was at anchor, her string lights winking at us in the darkness. 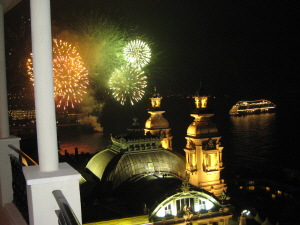 Suddenly a display of fireworks crackled and showered over the harbour, turning everything into a fairy tale, prompting us to raise our glasses and re-name our ship Tinkerbelle. Keith Allan and Lynne Gray sailed as guests of Crystal Cruises. 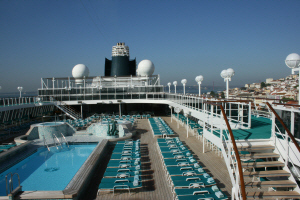 The twelve night cruise from Southampton to the Mediterranean on Crystal Serenity calling at Dublin, Cork, Oporto, Lisbon, Gibraltar, Barcelona, Monte Carlo and Civitavecchia cost from $4,886 (half price discount) including flights and transfers. A penthouse with butler service from $12,377 (discounted price). 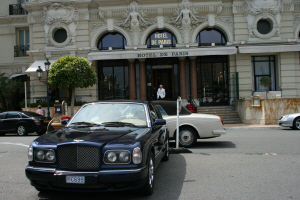 Hotel de Paris, Monte Carlo. Dinner from $178. Our cruise finished in Rome and we stayed two nights at the Hotel Hassler, which sits in the street at the top of the Spanish Steps. Another member of The Leading Hotels of the World group it commands amazing views over the city and from the dining room, where we met with one or two of our fellow passengers for dinner, we could watch the evening light fading over the roof tops. The Mediterranean cuisine is a feature of the newly renovated Imàgo restaurant. One of the youngest chefs in Rome, Francesco Apreda offers an unusual east meets west cuisine with dishes such as sea bass with a ginger sauce. We ate breaded scallops stuffed with mozzarella and black truffle and steak with endive, following this with a selection of Italian cheeses and a chocolate dessert. There is also a Wellness club offering a fitness room, massage, beauty treatments, sauna, steam bath, tanning shower and a terrace overlooking the Spanish Steps. The business traveller is also very well catered for with meeting facilities for up to 200 and high speed internet access in the rooms. Personal shopping and private tours can be arranged as well as wine courses at the International Wine Academy of Rome. At the bottom of the Steps and in the centre of the graceful Piazza di Spagna is one of the great fountains of Rome. However, it has no leaping jets of water to marvel at. Instead, the water leaks from all sides of the delightful Baraccia, or Old Boat. It was designed in the early 17th century by Pietro Bernini, father of the famous sculptor Gian Lorenzo Bernini. It was a stroke of genius to put it here and now attracts tourists to drink the fresh spring water while some risk the wrath of the police and bathe their feet in it. A few yards from the fountain and you are in the Via Condotti one of the worlds most fashionable streets. It was also home to none other than Giacomo Casanova during a spell away from his native Venice. Café Greco one of Europe’s oldest coffee houses is also a short walk down on the right hand side. Look back across the Baraccia and up the Spanish Steps and there are two rather elegant buildings that cleverly flank the Steps. The building on the right is where John Keats died and it now houses a small museum devoted to his poetry. The building on the left houses Babington’s Tea Rooms which were opened by an English lady in the early eighteenth century. They are still there serving afternoon tea. And so this was the very pleasant atmosphere that greeted us every morning as we stepped outside the Hotel Hassler. The owner and General Manager of the hotel is Roberto Wirth and he is the fifth generation of a famous dynasty of Swiss hoteliers. 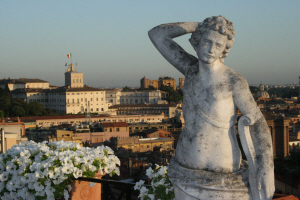 Born in Rome his hotel is testament to a very special hotelier for he was born deaf. Unfortunately he was away from the hotel during our visit so we were not able to discover more about his obvious passion for the hotel industry. Breakfast was eaten in the cool surroundings of the courtyard and an early morning stroll down the Steps and into the Piazza was the very best time to take in the delights of this remarkable area of Rome. We were sorry to leave and hope to go back. Legend has it that if you throw a coin into the Trevi Fountain you will return to Rome, although the real legend is that you must drink the water from the fountain under a midnight moon. We did neither but it won’t stop us going back! 6, Piazza Trinita dei Monti, Rome.